Recorded from Chicago: Our experiences with The Mandalorian, The Clone Wars, Episode IX, Star Wars Rebels, cosplaying, meeting our faves, and so much more. The theme of defiance takes center stage on this episode. In part one, we define it (how it is different than rebellion or resistance?). In part two, we talk about defiance throughout Star Wars. In part three, we speculate on future moments of defiance. The season finale of Star Wars Resistance is here! Caitlin and Charlotte discuss their thoughts and theories with this episode. Part one of the Star Wars Resistance season finale is here! Caitlin and Charlotte discuss “No Escape, Part 1” in this episode and give some theories. Caitlin and Charlotte discuss the latest episode of Star Wars Resistance, “The Disappeared." Caitlin and Charlotte talk all about Rogue One. In part one, they discuss tone. In part two, they dig into the impact and longevity of the film. In part three, they swap favorite moments. All this and more on this episode of Skytalkers. Charlotte & Caitlin discuss the years-long relationship between Disney Parks and Star Wars. In part one, they talk about the history of Star Tours and Star Tours: The Adventures Continue. In part two, they reminisce on Star Wars Weekends in Walt Disney World. In part three, they speculate about what’s the come for Galaxy’s Edge and beyond. Charlotte and Caitlin discuss Star Wars Resistance's newest episode in season 1, "The First Order Occupation." Caitlin and Charlotte discuss the newest episode of Star Wars Resistance, "Dangerous Business," episode 13. Caitlin and Charlotte discuss Finn’s character journey throughout The Force Awakens and The Last Jedi. In the final part, they speculate about where his character will go for Episode IX (stormtrooper uprising?). They trace his journey by Joseph Campbell’s Hero’s Journey. We’ve been podcasting for TWO YEARS! To celebrate, we’re visiting the Star Wars Dinner concept and updating our lists for 2019. Then, we take your questions on all things Star Wars and more, from the podcast creation to Episode IX speculation and much more. Thank you so much to everyone who have helped make this past year in podcasting the best ever. Whether you’re just now joining us or you’ve been with us since we started, we’re so happy you found us. We can’t wait for what’s ahead. Caitlin and Charlotte explore color symbolism behind lightsabers across the saga, dive into some Episode IX theories regarding sabers and rebuilding, talk about kyber crystals and their meaning, and much more. Part one: the symbolism of blue; part two: green, purple, and white; and part three: the meaning behind red. Charlotte and Caitlin return to discussing Star Wars: Resistance and cover the latest two episodes, "The Platform Classic" and "Secrets & Holograms." Charlotte and Caitlin get specific by analyzing the crawls in the beginning of each Star Wars movie. In part one, it’s all about the history of the crawl. In part two, they talk about their favorite parts, key mentions, what makes a crawl a crawl, and more. In part three, it’s all about rhyming crawls. What do they have in common? All this and more on this episode of Skytalkers. Charlotte and Caitlin discuss the latest episode of Star Wars Resistance, "Signal from Sector Six." On this episode of Skytalkers, Caitlin and Charlotte are joined by Courtney from the podcast Who Talks First and the fandom shop, Squadron Goals, to discuss the Mortis trilogy from Star Wars The Clone Wars. In part one, they talk about their first impressions of the episodes when they originally aired and watched them. In part two, they discuss the episode in detail as it relates to the characters within the Clone Wars. In part three, they talk about Mortis’ bigger meanings and discuss over what the future may hold for seeing this world once again. All this and more on this episode of Skytalkers! It’s the spooky season and we’re talking all about metaphorical and literal monsters throughout Star Wars. In part one, we define monsters. In part two, we share our favorite Star Wars monsters and discuss their symbolism. In part three, we go full fangirl and talk about Kylo Ren. All this and more on this episode of Skytalkers. Skytalkers discuss episode 3 of Star Wars Resistance, "Fuel for the Fire." Caitlin and Charlotte discuss episode 2 of Star Wars Resistance, The Triple Dark! Star Wars: Resistance is HERE and Caitlin and Charlotte are here to break down the first episode, The Recruit! In part one, they list their highs and lows. In part two, they break down the story. In part three, they explore this new crop of amazing characters. What’s next? Join us every week as we break down each episode of Star Wars Resistance! All this and more on this episode of Skytalkers. ... was said by Sabine Wren in Star Wars Rebels. In this episode, Caitlin and Charlotte look at the long history of hand symbolism throughout the saga. In part one, they discuss hand symbols throughout history; in part two, they talk about what it means when hands are "removed" in Star Wars. In part three, they talk about what it means when hands are joined. All this and more on this episode of Skytalkers. In this episode, Caitlin and Charlotte revisit Solo: A Star Wars Story with the digital release by covering their lingering thoughts about the newest film, their opinions on the bonus features plus what was learned, and they cover the deleted scenes. All this and more on this very chatty episode of Skytalkers! Here's audio from panel we are on at this year's Dragon Con: Episode IX Speculation! Thanks to our awesome panelists, Bethany and Riley Blanton (The Star Wars Report) and Alex and Mollie Damon (Star Wars Explained)! We had a great time at this year's convention -- big thanks to everyone we met who made the weekend the best! Charlotte and Caitlin go back to basics with a discussion on Joseph Campbell’s Hero’s Journey, Maureen Murdock’s Heroine’s Journey, villains, antiheroes, Byronic heroes, Reylo, Anakin Skywalker, and more. In part one, they talk definitions and history. In part two, they dive into what the creators have said about our heroes and villains: quotes from George Lucas, Rian Johnson, and JJ Abrams. In part three, they answer the question: Do these archetypes even matter? All this and more on this episode of Skytalkers. Art history and historic preservation are the topics of this long-awaited episode of Skytalkers. In an episode guided by Caitlin’s Masters, in part one, we discuss "the Lost 20” from Attack of the Clones, monuments, the Jedi, and remembrance. In part two, we talk about Sabine and Thrawn, and how art and art history define them as heroes and villains. In part three, Caitlin talks about film as a studied medium, the National Register of Historic Places + Star Wars, and Skywalker Ranch’s Archive and Library. We finish the podcast with a reading from Camille Paglia’s book Glittering Images. The finale to our George Lucas series is here! By George is our three-episode series on the work of George Lucas, separated by themes and dotted with his history. In this episode, we cover the prequel years up to the sale of Lucasfilm to Disney. We briefly touch on Strange Magic, the special editions, and much more. The themes we cover in this episode are Creation, Retouching, and Letting Go. All this and more on this episode of Skytalkers! By George is our three-episode series on the work of George Lucas, separated by themes and dotted with his history. In this episode, we cover the 70s and 80s — the Star Wars trilogy, his work on Indiana Jones and his friendship with Steven Spielberg, and, yes, we are going to talk about Captain EO. The themes we cover are Success, Independence, and Oversaturation. Plus, we get really excited about the fact that the Clone Wars is returning. All this and more on this episode of Skytalkers. By George is our three-episode series on the work of George Lucas, separated by themes and dotted with his history. In this episode, we’re tackling American Graffiti, THX 1138, Freiheit, 1:42:08, Look At Life, and how they relate to Star Wars. In part one, we cover the theme of adolescence. In part two, it’s all about the theme of freedom. Then, finally, in part three, we cover the concept of trauma and how George Lucas uses it to further his character’s journeys. An episode all about theories, expectations, and speculations! In Part One, Charlotte and Caitlin share their lists of theories and talk through them. In Part Two, they discuss their biggest hopes for episode 9. In Part Three, they get real about their realistic expectations for how the saga will end. What will it feel like if our major hopes don't come true here? All this and more on Skytalkers. Caitlin and Charlotte get into the concept of family in Star Wars: which is more prevalent, blood family or found family? They define family in Star Wars in part one, and talk a bit about the original trilogy, the prequels, Rebels, Clone Wars, and Rogue One. In part 2, they go into the concept of family in Solo: A Star Wars Story — spoilers ahead. In part 3, they talk about the theme of family + found family in the sequel trilogy and where they think it will all end. If “family” is a theme right up there with hope, then how will this factor into the end of the saga, Episode 9? All this and more discussion right here on Skytalkers. Spoilers ahead! Caitlin and Charlotte do their in-depth breakdown of Solo: A Star Wars Story. First, they discuss the story elements, including the plot structure and themes. Then, they talk characters — everyone from Han to Qi’ra to L3 to Lando to Enfys Nest. In part 3, they answer some listener questions related to the film including shipping, that cameo, Qi’ra’s character arc, music, and more. NO SPOILERS HERE — our spoiler-free review of Solo! This quick special is all about our trip to Hollywood to see Solo: A Star Wars Story and attend the world premiere! First, we give some final predictions before dashing off. Second, we have some audio of the premiere pandemonium. Lastly, Caitlin and Charlotte detail the whole red carpet experience and seeing the film in the Chinese Theater. And what did we think? We give a SPOILER FREE review of Solo: A Star Wars Story. Thank you for all the support! See you soon for our spoiler-filled immediate reaction! Last Shot by Daniel José Older preps us for Solo: A Star Wars Story by bringing us an exciting adventure with Han Solo, Lando Calrissian, and a ton of new characters (but also baby Ben Solo). On this episode, we discuss what we liked about the book and how it ties into the saga as a whole. We then discuss key themes throughout the novel: parenting anxiety, the joys of doing what you love, DROID RIGHTS, and change/personal growth. We then swap quotes to analyze. And maybe there's a surprise at the very end of the episode. Our 50th episode (!!!) is all about Force visions, premonitions, and cave sequences in Star Wars. What do these obstacles mean for our characters? What purpose do they serve in the story, and what do they mean? In part one, we talk about the prequel trilogy and the Clone Wars: Anakin's dreams, Mortis (Ahsoka and Anakin), and even the Clone Wars microseries. In part two, it's all about the original trilogy: Luke's cave sequence and his vision of his friends dying. We also talk briefly about Rebels. In part three, we discuss the sequel trilogy: Rey's vision in The Force Awakens, the mirror cave in The Last Jedi, and Rey and Kylo's visions together. All this and more on this episode of Skytalkers! Caitlin and Charlotte are excited to discuss all the bonus features on the Blu-Ray release of Star Wars: The Last Jedi. To begin, they give a review of how these bonus features stack up against previous Star Wars films. In part one, they discuss the feature-length documentary "The Director and the Jedi," and the respect they have for Rian Johnson, as well as the controversy surrounding Mark Hamill. In part two, they discuss the deleted scenes. In part three, they talk about extrapolated quotes from Rian Johnson's audio commentary of the film. Finally, Charlotte gives a brief review of the Music-Only version of the film. The Star Wars: The Last Jedi novelization, written by Jason Fry, is finally here! In this packed episode, we talk general perceptions, fun Easter Eggs, and favorite new-information. We get deep with the character section, and swap quotes and discuss what we've learned about each main character. Finally, we participate in "Lectio Devino" and swap chosen-quotes and describe how these passages make us feel, what they remind us of, and more. All this and much more discussion on this week's episode! The finale of Star Wars: Rebels is here and we're here to talk about it. Spoilers ahead! First, Caitlin gives her 30 second recap on this epic finale (A Fool's Hope, Family Reunion, & Farewell). Then, they each give 2 highs and 1 low about the episodes overall. Next, they discuss the story elements of Rebels: what is the state of the Rebellion? How did we feel about the ending? Could we have predicted it would come to this point? What makes a story especially "Filoni" and how do we feel about that? In the character section, we go through each character. We answer a listener email addressing some concerns about women representation in the finale -- and we give our thanks to the creators of the show, as well as the fans. The penultimate episodes of Star Wars: Rebels are here and Caitlin and Charlotte break "Wolves and a Door" and "A World Between Worlds" down. Spoilers ahead! SO MUCH TO UNPACK HERE. First, they give their highs and lows. Then, they dive into the story with questions like: What are the implications for the Star Wars saga overall? What about those voices? What does it all mean? What is the state of the Empire? In the character section, they discuss Ezra, Hera, Sabine, Ahsoka, sacrifice, and even the Emperor. See this post for the full list of quotes. One episode remains! Are you ready? Star Wars: Rebels is in the home stretch... Skytalkers' Fulcrum Files returns to discuss the two emotional episodes, Jedi Night and DUME. Spoilers ahead! First, Caitlin gives her 20 second recap of the episodes. Then, they give their 2 highs and 1 low. They discuss story next: How did we feel about the pacing of these episodes individually and as a two-part arc? Do we think the episode was balanced in giving our characters time to grieve while moving the plot forward towards the next step? In part three, they go through each character and their journeys, and they speculate on the future of the season. Caitlin finally read the Revenge of the Sith novelization! In part one, we discuss the merits of novelizations and how this one stacks up comparatively. In part two, they go through the characterizations of Padmé, Anakin, and Obi-Wan. In part three, they practice "lectio divina" and choose passages for each other to analyze immediately. It's REAL! We watched the Super Bowl spot and the official teaser of Solo: A Star Wars Story and have our reactions and thoughts! What do we think about Alden Ehrenreich as Han? Emilia Clarke as Qi'ra? We give our thoughts on the visual language, time period, and potential story elements. Inevitably, we ask: What does this story mean for the future of "anthology" films in Star Wars? Is Star Wars abandoning the different-genre exploration that was promised years ago? This, and of course, what we think of it all, on this special one-take episode of Skytalkers! Caitlin and Charlotte finish up their Star Wars: The Last Jedi recap podcasts with the final section, the "catch all." In part one, they answer plot-based questions, including: What’s something you would personally add or change? Can you define the force bond? What does "tied on a string" mean? In part two, they answer character based questions. They talk about Reylo. They get emotional. They talk about Carrie Fisher and Leia and redemption arcs. They get emotional. In part three, they speculate about the future of the saga. In the episode, Caitlin reads from two books: "Postcards from the Edge" by Carrie Fisher and "The Theater of War" by Bryan Doerries (narrated by Adam Driver). The Star Wars Escape Pods Network (Devin and Eve from Unmistakably Star Wars and Johnamarie Macias from Rebels Chat & The Wookiee Gunner) join Caitlin and Charlotte for a discussion of all things Star Wars! In part one, they ask: What keeps you coming back to Star Wars time after time? What is the core theme of Star Wars, after all these years? In part two, they discuss the new Star Wars: Rebels trailer. One final lesson? Is Ahsoka the convor? What's the future look like for Ezra and Kanan? What are our wants and needs for the end of the series? In part three, the gang talks The Last Jedi: redemption, themes, and some quick shots (who is better: shirtless Kylo or shirtless Anakin? Throne Room or Kylo vs. Luke?). Finally, the group gives their Star Wars dinner picks. Emo Kylo Ren makes an appearance on Skytalkers! In this special interview episode, Caitlin and Charlotte talk to the writer and voice behind the extremely popular Twitter account, @KyloR3n -- Emo Kylo Ren. What are Alexandra's creative inspirations? Her favorite tweets? What is her opinion of Kylo Ren and where his character is going to go? What are her opinions on the Rey and Kylo dynamic? All this and more on this special episode of Skytalkers! Follow Alexandra on her personal Twitter, @petridishes! You can find her writing for the Washington Post here. Part two of the Skytalkers in-depth breakdown of Star Wars: The Last Jedi is here with our character section. First, Charlotte and Caitlin dive into the connections that characters have with each other in the film. In TLJ, characters rarely spend time "alone" -- how do these relationships build up (or break down) our characters? Can we compare Force bonds throughout the saga with Kylo Ren and Rey's bond? What does their Force bond mean for the saga and the balance of the Force? Next, they dig deep into the Skywalker family and legacy. Is this the end of the Skywalker line? Finally, they talk about Failure and make some character predictions for episode 9. If you have things you want us to talk about in our next episode, don't hesitate to reach out to us via Twitter or by emailing us: skytalkerspodcast@gmail.com. Guess what? We’ve been podcasting for ONE WHOLE YEAR! To celebrate, Caitlin and Charlotte are revising their “Star Wars Dinner” picks from their first episode. Then, we take your questions on all things Star Wars opinions, including how we relate to Kylo Ren, what the best thing about starting a podcast is, what figurative “hill” we would have died on last year, and our year in podcasting. Next, we answer some personal questions: What do we want out of 2018? What’s Caitlin’s most embarrassing moment? Finally, we thank so many people who have made this past year the best ever. This episode is very reflective and personal on all things fandom and friendship. Thank you ALL for supporting this show for the past year. If this is your first episode, THANK YOU for clicking download. It means the world. May the Force be with you all! To kick off the Skytalkers three-part breakdown of The Last Jedi, Caitlin and Charlotte start with story and dive into themes, motifs, and structure of the film. First, the talk about their continuously evolving opinion of The Last Jedi. Then, they talk structure. Caitlin presents a spreadsheet of transitions, Charlotte compares Anakin’s arc with Kylo’s. They also determine Plot A vs. B vs. C. Finally, they share a list of themes they identified from the film. Check out of website, skytalkers.com, to see Caitlin’s transition spreadsheet in a PDF. So far, Charlotte and Caitlin have seen Star Wars: The Last Jedi four times. If you haven't seen the film yet, stop listening: spoilers ahead! First, they talk about where their opinion on the film stands as of now. In part one, they talk about the resistant plotline. In part two, they discuss the Luke Skywalker section + what we've learned about his journey for the past 30 years. What does Caitlin think of her favorite character now? In part three, we talk about Rey and Kylo Ren/Ben Solo and discuss whether we still think Ren-demption is possible. SPOILERS AHEAD! We saw The Last Jedi. We recorded our immediate reactions. We'll have more The Last Jedi podcasts throughout December! Thank you for accompanying us on this journey -- we'll never be the same after this movie! Is it every fan's dream to discuss Star Wars formally, at school? On this episode of Skytalkers, Caitlin and Charlotte talk to Michael and Hannah, who teach a theology class on Star Wars. They discuss what the class explores, what they've learned from students, and much more. Then, Charlotte and Caitlin come up with their own dream paper topics for writing about Star Wars. Should Caitlin write her masters thesis on Star Wars? Finally, they talk about what their "dream" Star Wars class would consist of. What would a Skytalkers class look like? We're one week out from The Last Jedi, people. No spoilers here. Find Michael Miller and Hannah Tatar on Twitter, @My_ComicRelief and @HannahLTatar. Charlotte and Caitlin take on discussing the edge-of-your-seat good midseason finale of Star Wars: Rebels, “Rebel Assault.” First, they start off with Charlotte’s rushed 20-second recap. Then, they discuss 2 highs and 1 low of the episode. Next, they discuss story, where they are in the Rebellion, and what they think is next for the second half of the season. Then, they discuss characters: Charlotte gives her newest Kanan theory and they discuss how it builds off Caitlin’s own theories. How does Ezra play into everything? What’s endgame for Hera and Kanan? All this, and more, on this episode of Skytalkers’ Fulcrum Files. The Last Jedi is almost here! Before the film’s release, Caitlin and Charlotte sit down to discuss their theories, what they think will happen, and why they’re banking on a Kylo Ren redemption (Ren-demption) arc. In part one, they discuss the newest TV spot, “Awake.” In part two, they talk about the marketing, the international poster, and make some comparison about the message Lucasfilm PR is trying to send. Finally, in part three, they unearth their old 2014-era Google Doc on theories for The Force Awakens. The conclusion of the show is them giving their plot expectations for The Last Jedi. The Skytalkers Star Wars: Rebels discussion show continues for this week's set of episodes, "Kindred" and "Crawler Commanders." After a quick 20 second recap of the two episodes from Caitlin, they dive into their 2 highs and 1 low of the pair. Then, they discuss story: they dive into lothwolf lore, where the Rebellion is, and what this means for Kanan. Finally, they talk characters, and get really excited about Kanera. All this and more on this episodes of Skytalkers' Fulcrum Files! Caitlin and Charlotte are back to discuss the two Star Wars: Rebels episodes from October 30th, "The Occupation" and "Flight of the Defender." First, Charlotte gives a very rushed 20 second recap. Then, the two swap their 2 pros and 1 con of the episodes. Next, they discuss story: they're finally back on Lothal, so what is it all for? What's the state of the Rebellion now and what the heck is up with the wolves? And the closed-caption ending? Finally, they talk characters: what does it mean to Ezra to return here? Is Sabine's hair metaphorical? Kanera feels galore. All this and more on this episode of Skytalkers' Fulcrum Files! This is it! Caitlin and Charlotte discuss the final installment in the Skytalkers Machete watching series. In part one, they discuss story: how does it feel going from Return of the Jedi to here? How is this story set up? Is it successful? In part two, they discuss characters: loving Finn's journey, Charlotte gets emotional about Rey, and they of course discuss Kylo. In part three, they answer a ton of Twitter questions and continue their final thoughts on this watch order. Can you compare The Force Awakens to The Phantom Menace? Is it a jarring transition? Find out their answers to these questions and more on the latest episode of Skytalkers. Charlotte and Caitlin's series where they discuss the latest episode of Star Wars: Rebels returns with a discussion on "In the Name of the Rebellion," a two-part episode. Caitlin is pretty impressive with her 20-second recap, and both Caitlin and Charlotte give their 2 highs and 1 low of the episode. Then, they discuss story: where are we in the Rebellion? What themes prevailed and why was this episode such a success? What do we make of choosing certain episodes to be one hour? Next, they discuss characters: Ezra, Ezra + Sabine, Saw, and Kanan. This and so much more on the latest episode of Fulcrum Files! Our new Rebels discussion show kicks off with a 20 second recap of the latest Star Wars: Rebels episode "Heroes of Mandalore." In part one, Caitlin and Charlotte give their 2 highlights and 1 pitfall of the episode. In part 2, they discuss story and where the Rebellion stands, the choice to open with Sabine's story, and more. In part 3, they discuss characters... including whether or not they think Sabine/Ezra could be a thing? What's next for Kanan and Hera? What is next for the entire ghost crew? All this and more Star Wars: Rebels discussions on this episode of Skytalkers' Fulcrum Files. Charlotte and Caitlin continue their Skytalkers Machete watch series with Return of the Jedi. They discuss elements of the story and answer: is it believable that this is the conclusion to this trilogy? Special edition ending celebration ending or yub nub? In part two, they dive deep into the character study with each main character. What is Luke dealing with in this film and how is it presented? What are our theories on how Leia “remembers” Padmé? Finally, they answer many questions from Twitter, like what do you think of Force Ghost Hayden Christensen and much more. Charlotte and Caitlin fangirl over the newest full-length trailer for Star Wars: The Last Jedi by giving their near-immediate reactions and commentary in a one-shot format. They discuss fandom pandemonium, whether That Scene is a flashback, Kylo's choices, Rey's decisions, and Finn's epic fight. The try to answer: what's up with Luke? Are these scenes really just mashed together? What is Lucasfilm preparing us for? All this and more on this episode of Skytalkers. Thanks to our awesome patrons: Kyle, Brandon, Chuck, Amy, Emma, Dean, Ryan, BJ, Swara, Jim, and Neil. You are all awesome and we cannot thank you enough! Caitlin and Charlotte return to their Machete watch series to cover Revenge of the Sith, a movie that holds a particular place in each of their hearts. In part one, they discuss story and how it’s so segmented. In part two, they get deep into the characters, their motivations, and what they think of the argument that Padmé gets “fridged.” In part three, they answer a bunch of Twitter questions, talk deleted scenes, and share some embarrassing teenaged stories. Charlotte has blinders with some key Star Wars facts. Charlotte and Caitlin are joined by their good friend Sarah Dempster (@SarahDemp, @GalacticFlair) to discuss Claudia Gray's newest Star Wars novel, "Leia, Princess of Alderaan." They first talk about the recent JJ Abrams news and share their complicated thoughts, the newest Rebels trailer, and their time at Dragon*Con. In part one, they talk initial reactions about the book. Then, they deep dive into some standout moments and discuss their implications. Finally, they take your Twitter questions regarding the book. Charlotte and Caitlin are back for the next addition into the #skytalkersmachete series: Attack of the Clones. First, they discuss story and what really worked for them this round of watching, and how this particular order enhances our viewing. Then, we get into the characters: Charlotte talks about why she responds to Anakin and Padmé, and Caitlin brings up points about how intriguing Count Dooku’s character is. In the last section, they talk about deleted scenes and answer some burning questions from Twitter. All this, plus much more on this episode! Our #skytalkersmachete series returns with the classic sequel, The Empire Strikes Back! We look at a listener email about Anakin’s virgin birth, and then get right into things. First, we discuss the story of the film; then, we talk character journeys. We ask: why is Luke so angry on Dagobah, as per Yoda? What do we think of the Han/Leia relationship as it is here? And finally, we talk about how this fits into the machete order since putting The Phantom Menace in front of it. We answer a ton of Twitter questions: we get into deleted scenes and the film’s initial reception. All this and more on this episode! Correction: Charlotte means Boba Fett, not Doctor Aphra, when discussing Vader learning about Luke. Also, we forgot to mention our dear Patron, Emma! We love you, Emma! Surprise! Charlotte and Caitlin are here mid-week to break down our favorite aspects of Anthony Breznican's Entertainment Weekly coverage of The Last Jedi. We cover Luke Skywalker, Rey and what her parentage means (yes, our theories emerge once again! ), and Kylo Ren’s struggle and—how we see it—his redemption. Also, we ask: should we #waitforVIII? All this and more The Last Jedi speculation on this episode! Jennifer Muro, the sole writer for Star Wars’ Forces of Destiny, joins Caitlin and Charlotte on the show! We talk craft, her favorite episodes, and she shares her Star Wars dinner picks. Then, we discuss your Twitter questions regarding Forces of Destiny—we talk what we hope for the future, our dream episodes, and more. Finally, we respond to criticism of Forces of Destiny. Check out Forces of Destiny on the Disney YouTube channel and Jennifer Muro on Twitter @jennifermuro and www.jenmuro.com. Thanks for stopping by, Jennifer! This edition of #skytalkersmachete is all about 1977's Star Wars: Episode IV A New Hope. We spend some time responding to a listener email, then move into part 1, which is all about the film's story. Part 2 really gets into the characters. We ask questions like: are these characters well developed? Why do we respond so much to these core characters? In part 3, we evaluate where this fits in in our updated Machete Order, which puts The Phantom Menace in the front. 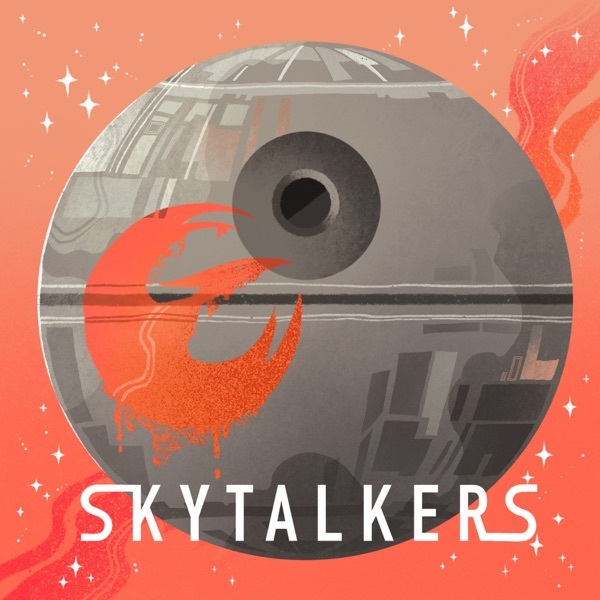 All this Star Wars discussion and more on this episode of Skytalkers: This Galactic Life! Follow us @skytalkerspod and individually @crerrity and @caitlinplesher on Twitter for constant Star Wars discussion! Visit us on skytalkers.com. Caitlin and Charlotte return for a special episode breaking down what we got from the D23 Expo in Anaheim! First, we go shot-for-shot looking at the behind the scenes sizzle reel for Star Wars: The Last Jedi. Then, we talk the new red-themed posters. What do they mean? Why are Rey and Kylo turned away from Luke? Finally, we get really excited over Walt Disney World’s and Disneyland’s upcoming Star Wars themed land: Galaxy’s Edge. All that and more on this special edition of Skytalkers: This Galactic Life! In part one, we talk story. In part two, we get into the characters. In part 3, we discuss thoughts on the machete order, initial impressions, and the behind the scenes documentary of The Phantom Menace. All this and more on this episode! This week's episode is all about different visions of Star Wars. Charlotte and Caitlin sit down with Jim and Alex from the very awesome, super beautiful fan comic “A Star Wars Comic” to talk process, the state of comics, and their newest issue “Wild Space.” Then, we talk the resurfaced Padmé concept art from Revenge of the Sith, which depicts her with the knife. And, finally, we’d be remised if we didn’t freak out a bit about the latest news of the Untitled Han Solo Star Wars Story anthology film. Phil Lord and Christopher Miller are OUT and Ron Howard is in. What does it all mean? We flesh out some initial thoughts. As always, join us here for an in-depth discussion of all things a galaxy far, far away. Follow us on @skytalkerspod for more fun and individually @crerrity and @caitlinplesher. To learn more about A Star Wars Comic, check them out at astarwarscomic.com, @astarwarscomic on Twitter, and see their comics every month new on the 25th. Their current issue “Wild Space” should not be missed! Caitlin and Charlotte are back for another episode of Star Wars interviews and discussion. On this episode, the girls chat with Annalise Ophelian of “Looking For Leia,” an upcoming documentary on Star Wars fangirls. She tells us about how the project came to be, and how you can support it. Then, Charlotte and Caitlin tackle the hard-to-talk about subject about Leia Organa’s presence in future Star Wars films. Should Leia be recast from Carrie Fisher? The question isn't as simple as one may initially think. Part 3 dives into how Leia is represented across canon: they talk comics, books, and her spot on Rebels. As always, join us for an in-depth discussion on our favorite space saga. To learn more about “Looking for Leia,” visit their website lookingforleia.com, @leiafangirlfilm on Twitter, and their kickstarter page! Caitlin and Charlotte are joined by Sarah Dempster, Star Wars blogger and super fan, to discuss Rogue One's Jyn Erso and Beth Revis’s new Star Wars novel, “Rebel Rising.” They discuss pros, cons, and our thoughts on Jyn as a character. They also touch upon the question of whether the Star Wars films should be dependent on the new books as a character story source. All this and more on the newest Skytalkers episode! What does the red mean in The Last Jedi poster? When did Anakin "officially" become Darth Vader? What is the best "new canon" book addition to the Star Wars universe? All this and more are answered by Charlotte and Caitlin on this latest episode of Skytalkers: This Galactic Life. Follow us @skytalkerspod on Twitter and individually @crerrity and @caitlinplesher. Visit us at skytalkers.com. Skytalkers Charlotte and Caitlin take a deeper look at Star Wars: The Last Jedi trailer in part one. In part two, they talk about the merits and downfalls of the term “Gray Jedi”—and what it means for the future of our beloved saga. Finally, in part three, Kirsty and Rachael from Scavenger’s Hoard podcast stop by to discuss what they see happening for Rey’s character based on the Heroine’s Journey. They also tackle the controversial ship of “Reylo.” (*gasp*) You won’t want to miss any of this discussion! Follow us on @skytalkerspod for more fun and individually @crerrity and @caitlinplesher. You can find Scavenger's Hoard on iTunes and @scavengershoard. Thanks for listening! We did it—we survived Star Wars Celebration Orlando! Tune in for this very special episode of Skytalkers: This Galactic Life as Caitlin and Charlotte report from SWCO, the largest Star Wars convention yet. Even if you didn't make it, join us as we move chronologically through our four days, starting with the 40th anniversary panel, day-by-day recaps, The Last Jedi initial trailer reactions and audio from fans seeing it for the first time, and much more panel updates from the galaxy far, far away. Skytalkers Charlotte and Caitlin recap the amazing season 3 of Star Wars: Rebels! We discuss our favorite episodes, key moments, and hopes for the next season. First, we talk about Sabine Wren and her journey throughout this season; then, we dive deep into "Twin Suns" and Obi-Wan and Maul's fated relationship; and finally, we discuss the two-part finale, "Zero Hour." Follow us on Twitter @skytalkerspod and find us at skytalkers.com and assemblyofgeeks.com. Visit our Patreon page to support our programming. On this episode, Caitlin and Charlotte talk about their plans for the upcoming Star Wars Celebration 2017 in Orlando! Join us to grab major insider tips of the trade from some seasoned Celebration regulars as we prepared for SWCO. First, we swap stories about what we’re looking forward to most. Then, we sit down with Savanna Kiefer of The Dorky Diva blog and podcast. Savanna shares her experiences with the 501st, costuming, and tells us some seriously amazing Celebration tips for what to be prepared for—namely, line waiting. Finally, we talk to Star Wars Celebration pro Scott Murray of The Geek Directive podcast; he shares tips and memories from his past Celebrations and what he’s looking forward to the most. Check out Savanna’s blog at http://www.thedorkydiva.com/ and @Savanna_Kiefer. Find Scott Murray over at http://www.assemblyofgeeks.com and @MrScottMurray. Follow us on Twitter @skytalkerspod and at skytalkers.com. Visit our Patreon page to support our programming. On this episode of Skytalkers: This Galactic Life, Charlotte and Caitlin spend their three-part discussion getting deep into the Original Trilogy, the Prequel Trilogy, then the Sequel Trilogy. Join us as we talk about what sets each trilogy apart, their strengths, weaknesses, our favorite aspects, and what we hope to see in the future of Star Wars. We talk Padmé, Kylo Ren and Rey potentially switching places, politics in Star Wars, visual keys in the films, and much, much more. We'd love to hear your feedback--follow us on @skytalkerspod; Charlotte @crerrity and Caitlin @caitlinplesher; and on our website, skytalkers.com. We are officially on iTunes & Twitter! Just a quick post to let everyone know that we are officially on iTunes and Twitter. Feel free to subscribe to us on iTunes and leave us a review. Click here to view our podcasts on iTunes! Also, we’ve joined the world of Twitter. Follow us @skytalkerspod! May the Force be with you all! Only one month after release… SKYTALKERS Caitlin and Charlotte discuss everyone’s favorite new Star Wars film, Rogue One: A Star Wars story on our latest podcast. Listen for our in-depth character analyses, thoughts on Easter Eggs, Michael Giacchino's score, and so much more. Thanks for listening! The strongest fans have hearts of kyber…. Welcome to the Skytalkers Podcast! We are so excited to begin talking about our love of Star Wars in a more public setting. Thanks for listening!